When you run this code sample, a provider-hosted add-in appears, as shown in Figure 1. 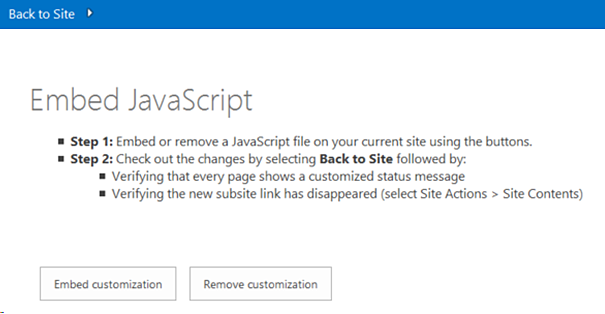 Creating a status bar message on all pages in the SharePoint site, as shown in Figure 2. Removing the new subsite link from Site Contents as shown in Figure 3. Creates a new custom action, and assigns the script block definition created in step 1 to the new custom action. Adds the new custom action to the website. All pages on your SharePoint site will now run scenario1.js and display the UI customizations shown in Figure 2 and Figure 3. SharePoint uses Minimal Download Strategy (MDS) to reduce the amount of data the browser downloads when users navigate between pages on a SharePoint site. For more information, see Minimal Download Strategy overview. In scenario1.js, the following code ensures that whether or not your SharePoint site uses Minimal Download Strategy, RemoteManager_Inject always runs. Hides the new subsite link on the Site Contents page.